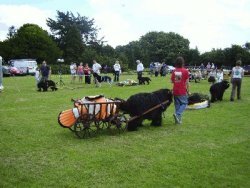 NEWForest Working Dogs is a group of owners and dogs, primarily Newfoundlands, working at training towards traditional water work, draught work and anything else deemed worthwhile, and demonstrating the capabilities of our dogs at occasional events. 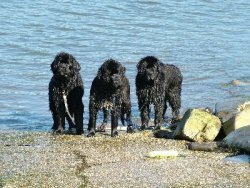 Whilst some of the aim is to work towards regulated water and draught tests, the primary aim is for the dogs and owners to enjoy themselves. Working with your dog can be a rewarding pastime as well as a great way of keeping them fit and healthy. 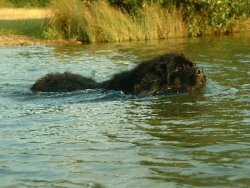 Allowing large breeds such as Newfoundlands the freedom to swim lessens the effect of gravity and provides the best form of exercise possible. Carting is able to demonstrate their incredible strength and endurance. 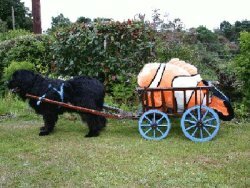 We do water work most Sundays in the summer and carting/obedience events when possible in the winter. We occasionally do obstacle courses in the summer, and we always have a Christmas Party. 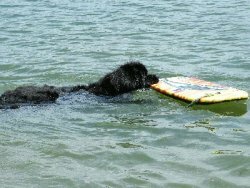 In addition to Newfoundlands, all dogs capable of working towards the three Newfoundland Clubs water and draught standards are welcome, typically Bernese and Leonberger but please contact us for advice.